The reactor in one of the units lost its cooling water, heat built up, and radioactive gas burst out and spread all over Europe and parts of the USSR. On the April 26, 1986, a nuclear power station at Chernobyl in the Ukraine, then part of the USSR, caused the world’s worst nuclear accident. The tragedy followed a routine maintenance operation when something terrible went wrong and radioactive gas drifted all over Europe. The disaster continued to claim more victims long after the accident disappeared from the public eye. The Chernobyl nuclear power plant near Kiev in the Ukraine, formerly a state of the Soviet Union, was the pride of the country’s nuclear power program. It was the biggest installation of this kind with four generators, each producing one thousand megawatts of electricity, and two more of the same kind under construction. Construction of the first unit began in 1971 and by early in 1986, with four units operating, the Soviet government was about to launch a five-year program in which several new Chernobyl- style plants were to be built. The decision to go ahead was made in February of 1986 and the Communist Party Congress was to approve it in June of the same year. Between the two dates came the explosion of Chernobyl’s number four reactor. The initial events were similar to accidents at other nuclear facilities. The reactor lost its cooling water and the nuclear fuel elements began to heat up. Action can be taken at this stage to bring in emergency supplies of water. Time is thus gained to locate the trouble and fix it. 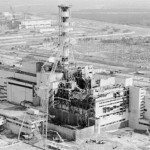 In the case of the Chernobyl accident, nothing was done to counter the buildup of heat and soon dangerous levels of radiation were being released into the atmosphere. The reactor did not have a protective building around it to prevent the escape of these radioactive gases. Finally, the heat level rose so high that graphite in the reactor core caught fire and a burst of radioactive material swept over the surrounding countryside devastating everything. At the time of the accident the reactor was undergoing routine maintenance and that required a shutdown. The manager of the plant decided to conduct an experiment during this time, a test that could only be conducted during a shutdown. The manager wanted to know how he would deal with a reactor problem if power were unavailable from the main electrical grid. Even when a reactor is shut down it still requires power to maintain the cooling circuit. His experiment was to use diesel generators in such an emergency and he hoped that the fifty seconds or so that these engines required to come up to full speed would not jeopardize the operation. No one knows exactly what went wrong with the experiment. We only know that the reactor heated up and then burst into flames. It happened in the middle of the night. A plume of radioactive material and radiation shot upward into the sky and then wind blew this cloud northwards across Poland and Scandinavia. A day later, Swedish technicians at a nuclear facility in that country picked up high levels of radioactivity. It was the remnants of a much thicker cloud that did most damage in the area immediately around the Chernobyl plant and second greatest damage as it passed over Belarus. Nothing was said about the event at that time, nor was much revealed for days afterwards. Characteristic Soviet secrecy surrounded the event. Some reports were lost or destroyed. The Soviet Union was anxious to maintain a positive approach to nuclear sources of energy because there were plans to expand them. They did not want to arouse public fears. All this secrecy took place in the face of accurate information that was available to Soviet authorities telling them exactly how much radiation had reached any part of eastern or northern Europe. The Test Ban Treaty with the United States demanded that each side possessed the ability and the equipment to do this. In full knowledge of the terrible consequences of exposure to radiation, the Soviet Union refused to release what it knew until compelled by external evidence. The staff at the plant attempted to assess the extent of the damage to unit four and to limit the spread of fire to the other reactor units. In doing so, many of these people averted what may have been a far greater catastrophe but also lost their lives as a result of lethal doses of radiation. Fire fighters risked their lives pouring water into the burning unit four reactor. Over a period of two weeks the Soviet Air Force dropped more than 10,000 tons of material into the reactor core to try and smother the fire. The pilots who flew on these missions died from the massive radiation doses they received and a dozen giant helicopters became so radioactive that they had to be dumped along with trucks, cars and other things around Chernobyl. In a reactor core, when heat rises sufficiently high, hydrogen explosions occur. In unit four, explosions of this kind hurled burning lumps of graphite and reactor fuel into the air that then landed on neighboring buildings and set them on fire. Most of the buildings had tar roofs and this fueled the fires. Once the fires were extinguished there was the question of what to do with all the radioactive debris that had escaped from the reactor core. It was decided to gather as much as possible and push it back into the reactor. This dangerous task was at first undertaken by robots but these were soon found to be unable to cope with the terrain. They kept getting stuck so a fateful decision was made to use humans. Choosing to use people for this task was tantamount to killing them. Everyone involved with nuclear installations knew by this time the deadly effects of radiation. The men, mostly from the army, were only able to work for a maximum of one minute even with heavy lead protective clothing on. Radiation levels were dangerously high. The one minute of work proved to be too much for some. They later succumbed to serious illness from their exposure to radiation. In total, almost one million men worked on the cleanup and the construction of a sarcophagus that would seal up unit four and stop the spread of radiation. The sarcophagus consisted of a massive concrete container that would encircle the damaged reactor and form a roof on top. It took seven months to complete, was two hundred feet in height, and stretched for two hundred feet along each side of the reactor building. Construction was speedy and the quality of work correspondingly poor. Everyone wanted to minimize the workers’ exposure to radiation. The container was intended to last for thirty years but within a decade cracks and weaknesses appeared and repairs were needed. In addition, the concrete was gradually weakened by irradiation from within and tension from the huge temperature difference between inside and outside. Scattered around the Chernobyl nuclear power plant were hundreds of dumps of radioactive waste. These usually consisted of open pits with linings of clay, containing anything from soil, timber, and vehicles to domestic items such as refrigerators and clothing. Some of the pits contained the remnants of the forest which surrounded the power station and absorbed so much radiation that the trees had to be destroyed and treated as radioactive waste. These pits became a big environmental hazard because they posed a threat to the main water table. This water table is linked to the Dnieper River which supplied the water needs of thirty-five million people, including the residents of Kiev. Police and military personnel guarded the area around Chernobyl, ensuring that no one ventured close to lethal radiation. In spite of that, a few people, mostly the elderly, were allowed back into their old homes. They insisted that they could not see, taste, smell or touch the deadly radiation so it did not bother them. While they might not be concerned, future generations must. The long-term effects of radiation have yet to be understood. Such effects modify the genetic structures of animals, food, and humans. The Chernobyl accident led to huge health problems in the Ukraine and elsewhere. Plant personnel, fire fighters, medical staff, and cleanup workers suffered the most. Reports from Belarus indicate a 50 percent drop in birth rates and a steady rise in miscarriages and birth defects. Other estimates claim that over three million Russians suffered radiation exposure with 370,000 likely to develop a radiation-linked illness. By 2001, estimates of total deaths from the Chernobyl accident totaled 15,000. On the wider scale of Europe other kinds of evidence mounted. Researchers were able to counter the Soviet claim that no other country was affected by radiation from the accident. It was all propaganda, claimed the Soviets, when the countries of Western Europe refused to accept agricultural produce from Eastern Europe. Within a year, the evidence of widespread devastation was overwhelming and the USSR was forced to accept it. Scandinavia, Britain, West Germany, Italy, and all the countries in between had been hit with damaging radiation. A very large area had been contaminated. Sweden was one of the hardest hit with much of the damage being carried in rain. An area of 4,040 square miles, 175 miles north of Stockholm, was so badly contaminated that all the grass had to be harvested and burned. Thousands of gallons of milk from this same area was poured away daily for some time. In the far north of Sweden, where the Lapp people live, levels of radiation was twelve times the permissible limit. These people were totally dependent on reindeer for almost everything they needed. The Swedish government helped pay the costs of destroying about 50,000 reindeer. To make matters worse, the vegetation of northern latitudes has a very slow rate of decay for radiation contamination. In 1987 it was estimated that much of the vegetation and soils of the Lapps will remain contaminated until the year 2030. In December 2000, the last of Chernobyl’s four reactors was shut down permanently, the final act in a financial deal struck between western nations and the Ukraine. The nuclear power plant and an area extending outwards for nineteen miles in all directions became a wasteland as badly polluted as was Bikini (see Bikini Atoll, Marshall Islands, nuclear tests). Like Bikini it will remain a useless desert far beyond the lifetime of those who witnessed the original catastrophe. The stone coffin erected around the plant at the time of the accident was still in disrepair in 2000. It had been built over the plant to prevent more radiation escaping and the work at that time was done at high speed and at enormous risk to all involved. To minimize the health hazard work shifts were limited to fifteen minute stints. Even fourteen years later, as the reactors were being closed down, repair men with special clothing to protect them from radiation could not stay on the roof longer than five minutes at a time. Radiation levels around cracks were seven times higher than the amounts regarded as unacceptably high.